When Abigail Foster first learns that she has a substantial bequest from her late Aunt Marian, she wants nothing to do with it. She leaves the money in the bank untouched and ignores the lawyer’s questions about what she intends to do with the family mansion and its contents. Abby, who has had no family since her grandmother’s death, feels no obligation to honor a great-aunt of whom she has never heard. But when Aunt Marian’s lawyer proves to be something of a gadfly, Abby requests a leave from her job as an elementary school teacher in Nova Scotia to travel to Jewell Cove to check on the house. She finds the small Maine town unexpectedly quaint and charming. Quaint and charming are not apt descriptors of her first look at Foster House. Its size is intimidating, as is the amount of work to be done before it can be sold, and, despite the clearly valuable antiques that fill it, the house has a heavy, gothic air. Gothic too is the feeling the grand staircase and the door to the basement evoke, but the chill disappears when Abby discovers the library, a room with walls of books that inspires visions of drinking tea and reading Jane Austen before a crackling fire. But keeping the house is impractical, and Abby’s plan is to make repairs to the house that has been neglected for a decade, sell it as quickly as possible, and return to her life. But first she needs a contractor. Tom Arseneault knows all about the legendary House on Blackberry Hill, from the details of its being built by Captain Jedediah Foster, son of one of Jewell Cove’s founding fathers and the great-grandfather of Abby’s Aunt Marian, to the rumors of its resident ghost. Tom needs the work since confidence in economic recovery is shaky enough that jobs are still scarce for a contractor in Jewell Cove, but he also knows that he’s the best man for the job. No one else will combine the necessary skills with his respect for the workmanship of the house and his commitment to its preservation. The trick is to convince the prickly owner that she needs him. It doesn’t take long for Abby to learn that she does indeed need the hunky contractor to renovate her house. He proves to be a good friend too, especially when the ghost of the House on Blackberry Hill turns out to be more than rumor. But Tom has issues that he’s not willing to talk about and a past that has created an estrangement between him and Josh Collins, his cousin and one-time best friend. Abby knows she doesn’t need to let herself fall for someone with so much baggage, and anyway she will soon be leaving Jewell Cove. Tom Arseneault will be just a memory. Or so she tells herself. 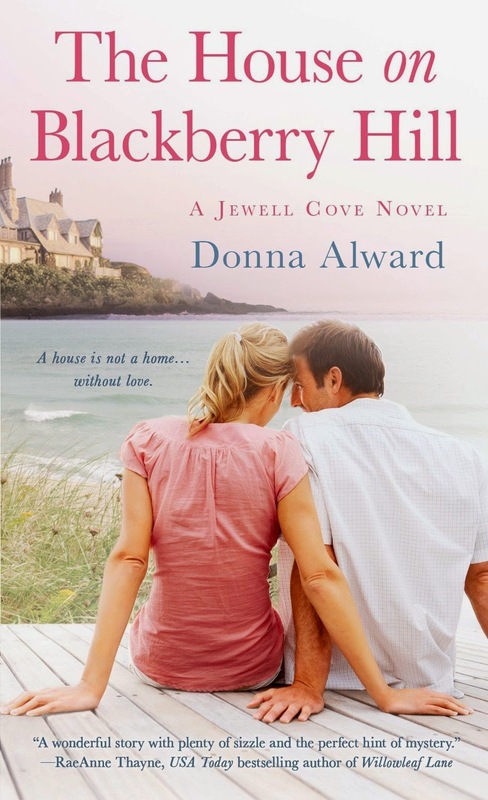 The House on Blackberry Hill is the first book in the Jewell Cove series and my first book by Donna Alward, an author heretofore best known for her novels in the Harlequin Romance line. It is an appealing introduction to this small northeastern seacoast town where extended family is plentiful and people’s roots in the town are deep. Abby and Tom are likeable characters, and the supporting cast, also likeable, sparks enough interest to promise solid stories as the series continues (I’ll take Josh and Rick, please) without distracting from the central story in this book. Abby and Tom’s story is a nice blend of mystery and romance. The ghost is poignant rather than creepy; I found her reminiscent of a Nora Roberts ghost. Abby’s initial reaction to the presence of the ghost seemed spot on to me. As Tom turned to lead her into the kitchen, her heart stopped. Over Tom’s shoulder she saw a woman standing in front of the fireplace. Sad eyes watched her from a pale face. Dark hair curled around her shoulders and her simple, pale blue dress fell just to her knee. Before she could made a sound, the image faded for just a moment. This was impossible. It had to be a trick of light, something in her imagination. Because the other alternative was that Abby was looking at a ghost. Readers who are also HGTV fans likely will find details of the house and its renovation an interesting added attraction. Tom’s behavior may inspire an urge to kick him a couple of times, but he redeems himself beautifully. And I really liked that the restoration theme moves beyond the house to encompass restored families, past and present. If you are a reader who appreciates small-town romances but are looking for something that is a bit different, I think you will enjoy Donna Alward’s debut as a St. Martin’s author. I certainly did. Thanks for the info on this book. Am adding to my list. Great review, I have always loved her books. I love Donna Alward's books. She deals with issues real people face usually concentrating on one or two in a book. Her characters have a reality about them. They are dealing with life the way most of us do - the best they can, making mistakes along the way. This story line has many things I like and have been dealing with - old house, renovations, antiques, and we even have our own ghosts. Most of her earlier books were set out West (the Canadian West). It will be interesting to see how she does with a New England setting. Thanks for another well done review. Hopefully those who are not familiar with Donna will read her books. They will be glad they did. I really like the synopsis of this plot and I think it would be a terrific can't-put-down novel. Thanks for the heads-up. I'll definitely put it on my Wish List. I like small town romances. I do want to read Donna's first novel with St , Martin's Publishing House!